Two men left a homemade bomb inside a restaurant in the Canadian town of Mississaugua on Thursday night, fleeing the scene after it blew up, injuring more than a dozen people, according to police. Authorities said at least 15 victims were taken to area hospitals with injuries, including three who were critically wounded. The Peel Regional Police said in a tweet they were looking for two unidentified men who entered the restaurant and "detonated an Improvised Explosive Device." Police Sergeant Matt Bertram said later Friday that the two suspects had their faces covered to conceal their identity, prompting the public appeal for help catching the culprits. "Two parties fled the scene immediately after the incident," the police said on Twitter, seeking the public's help in identifying and locating the suspects. One of the men was described as being around 6-feet tall in his 20s, with a "stocky build" and "light skin." The second suspect was described as a man of similar height with "fair skin" and a "thin build." Both were wearing hooded jackets and hats in an image released by police, taken from surveillance video at the restaurant. "We're looking to speak to the individuals seen fleeing the area and looking for the public's assistance in identifying them," Peel Regional Police Constable Iryna Yashnyk told media gathered at the scene. 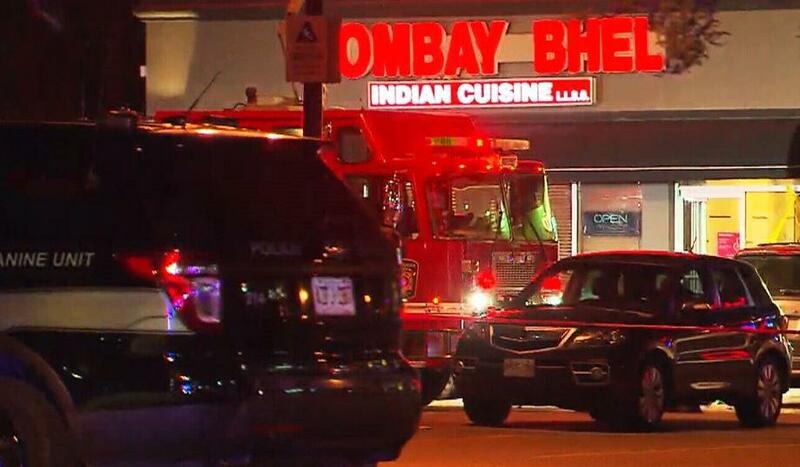 Police first responded to calls of an explosion at the Bombay Bhel restaurant in the Toronto suburb of Mississaugua, in Ontario, around 10:30 p.m. on Thursday. The victims were transported to regional trauma centers with "blast injuries," according to Peel Region paramedic Joe Korstanje. Andre Larrivee, who lives nearby, told Canadian broadcaster CTV, a CBS News partner network, that he was watching television when he heard a "really loud" explosion. Others in the area at the time also reported hearing one large blast.